The new Nissan Micra Kuro and Shiro are the latest additions to the Japanese manufacturer’s hugely popular city car range. The two new models upgrade features normally found on the Micra Acenta with exclusive paint and trim and exceptional as-standard characteristics. And this is all without a premium price-tag: both the Nissan Micra Kuro and Shira are priced from only £11,550 in the UK. In Japanese Kuro and Shiro mean black and white respectively, so it’s no surprise that one of the new Micras’ distinctive features are the paint options. The Kuro comes in Nissan’s spanking new metallic Sapphire Black shade, while owners of the Shiro have a choice of either Pearl or Alabaster White. 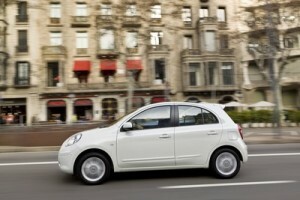 Inside, the chic black and white theme adds a touch of classic glamour to the Micras. The ivory-effect dashboard and trim and light cream upholstery contrast stylishly with the cabin’s black background. That’s what Nissan promise with their smart parking system. Sensors in the Micra Kuro and Shiro measure the size of a space as you draw alongside, letting you know whether or not it’s too small. If it is the right size for your Micra, the parking system will help guide you in. Both the new Nissan Micra’s come with heated front seats and climate control as standard. You can choose to upgrade to Nissan Connect, combining sat-nav with Bluetooth, USB and iPhone/iPod connectivity, for just £400. These include body coloured mouldings, bumpers and mirror surrounds, 15 inch alloys and 60/40 folding rear seats. Safety components encompass ABS with brake assist, ESP, power steering and driver, passenger and curtain airbags. The new Micra’s are available with either the 1.2 engine or Nissan’s new DIG-S engine, with manual or automatic gearboxes. According to Nissan, the low-friction, three cylinder DIG-S engine is one of the cleanest and most efficient petrol engines available at the moment. Fitted with Stop&Start to minimise fuel consumption, on the Nissan Acenta it gives does 65.7 mpg on its combined cycle, with CO2 emissions of 99g/km. If you’re interested in buying or leasing a new vehicle contact our sales team. Alternatively, visit our website where you will find new and used Nissan’s available for sale or on finance.